All of our pilots are military trained, with thousands of hours of experience. They fly many missions every week and are required to go through rigourous training in Israel and the US. All pilots are regulated under CAAI standards. Furthermore, our office staff in the US and Israel maintains a high standard of customer service. They strive to meet every customer’s greatest expectations. We pickup from anywhere in Israel: the ports of Ashdod and Haifa, Jerusalem, the Dead Sea, Eilat, Tel Aviv, and more. Transportation to and from the helicopter is included in the price. We take you anywhere you want to go. For charter operations we use three helicopters: two Eurocopter BO 105s and one Bell 412 available upon request. S-76: Seats 8 passengers Twin-engine Jet Helicopter BO 105: Seats 4 passengers Twin-engine Jet Helicopter. Lahak Aviation provides Medevac services and offshore oil rig transport in Israel. Operating since 2005, our company has an impeccable safety record. 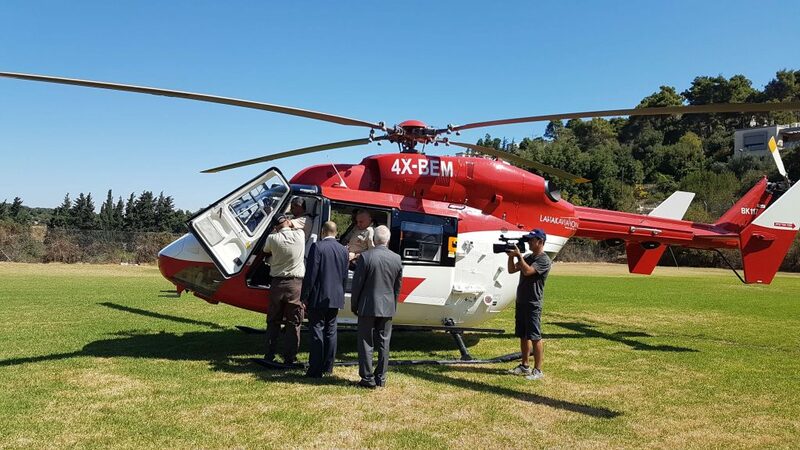 We operate a joint venture with PHI, who is one of the world’s leading helicopter service companies. All helicopters and crew are certified by The Civil Aviation Authority of Israel. We have many customizable trips, but also offer the freedom to choose. We build our schedules based on what you need. Transportation to and from the helicopter is included in all prices. Lockheed Martin Executives Noble Energy Executives United States & Israel Goverment Officials.